Antarctic organisms, including penguins, are susceptible to parasites and pathogens. Effects of infestation could differ in different locations along a geographical gradient from north to south consistent with conditions that affect the prevalence and virulence of parasites and pathogens. The immune system, including immunoglobulins as the main component of the humoral immune response, is the major way by which organisms confront infestation. We investigated the variation in immunoglobulin levels in three species of antarctic penguins (Pygoscelis antarctica, Pygoscelis papua, and Pygoscelis adeliae) along a geographical gradient from King George Island (62°15′S) to Avian Island (67°46′S). We found that immunoglobulin levels increased northwards in all the three species. This could indicate a higher impact of parasites and/or pathogens relative to the existing gradient in temperatures along this coast. 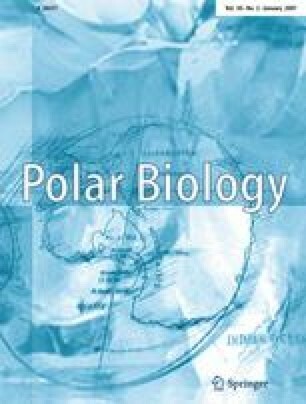 Changing temperatures, consistent with global climate change, could be altering the ecology of parasite or pathogen infestation within the biota of northern Antarctica. We have also found marginal differences in immunoglobulin levels between sexes in both chinstrap and gentoo penguins. This study has been funded by the Acción Especial project REN2001-5004/ANT of the Spanish Ministry of Education and Science. The project CGL2004-01348/ANT supported AB while the paper was written. We very much appreciated the hospitality and logistic support of the Spanish Antarctic Bases “Juan Carlos I,” “Gabriel de Castilla” and the Spanish Polar Ship “Hesperides” and specially the Spanish Polar Ship “Las Palmas” which provided us the logistic support and transport to the localities. We thank Elena Arriero and Rafa Barrientos for laboratory assistance with molecular sexing. We also thank two anonymous referees for their comments that improved early versions of the manuscript.